What is poetry? is so nearly the same question with what is a poet? that the answer to the one is involved in the solution of the other. For it is a distinction resulting from the poetic genius itself, which sustains and modifies the images, thoughts and emotions of the poet's own mind. The poet, described in ideal perfection, brings the whole soul of man into activity, with the subordination of its faculties to each other according to their relative worth and dignity. He diffuses a tone and spirit of unity that blends and fuses by that synthetic and magical power, the imagination. This power put into action by the will and understanding...reveals itself in the balance or reconciliation of opposite or discordant qualities: of sameness, with difference; of the general, with the concrete; the idea, with the image; the individual, with the old and familiar objects; a more than usual state of emotion with more than usual order; judgement ever awake and steady self-possession, with enthusiasm and feeling profound or vehement; and while it blends and harmonizes the natural and the artificial, still subordinates art to nature; the manner to the matter; and our admiration of the poet to our sympathy with the poetry. NOTES: The soul is the imagination. 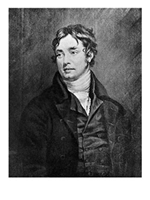 Coleridge's assertion that the imagination is both synthetic and magical only reaffirms what is already known about him. His works, especially in the Lyrical Ballads, deal with the supernatural in so far as they express real emotions regardless of whether one believes in the phenomena. Similar to William Blake's philosophy, this power of the imagination is revealed in oppositions.